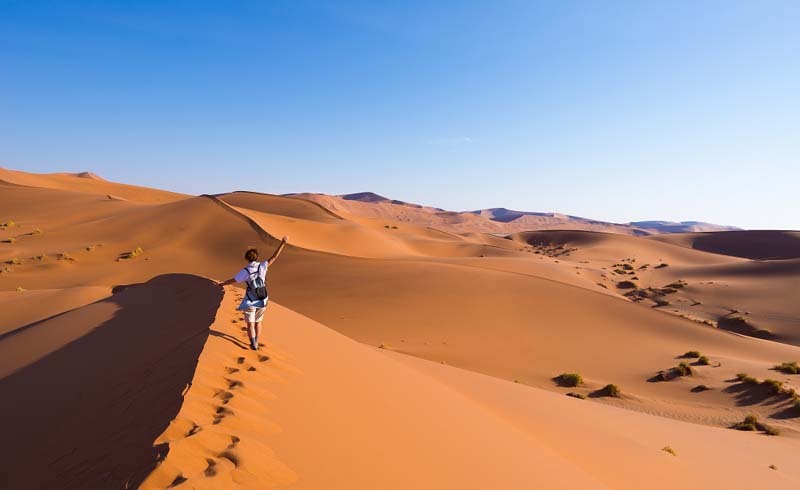 The Western African nation of Namibia offers a surprising number of adventurous activities for travelers, including sand dune climbing and challenging, long-distance canyon hiking. For adventure-seekers, Namibia may be the best destination in Africa. 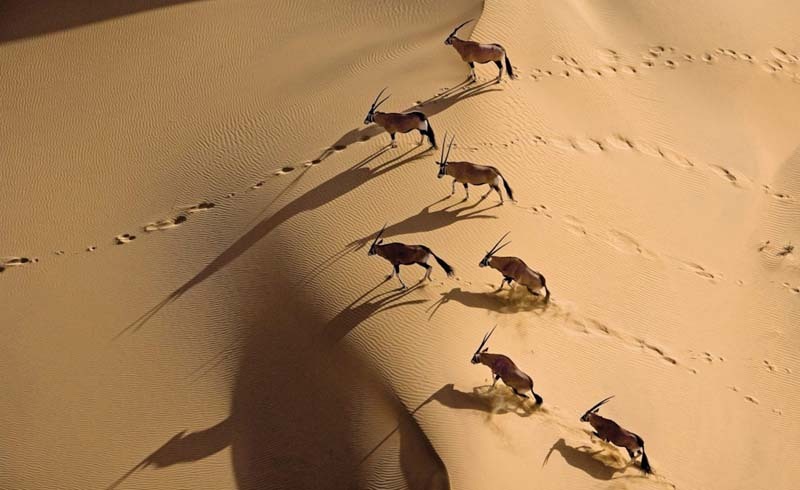 In addition to providing some of the continent's best safari action at Etosha National Park, Namibia offers visitors the chance to climb and ride quad bikes on ancient sand dunes, skydive in the desert, and complete a five-day hike in one of the largest canyons in the world. More than a million tourists visit Namibia each year, and that number is expected to continue growing in 2019 as more foreigners discover the country’s incredible natural wonders. Keep reading to discover a few of the best adventurous things to do in Namibia. Serious hikers seeking long-distance hiking without the crowds will be hard-pressed to find a better spot than Fish River Canyon. Based on its length and depth, Fish River Canyon is generally considered the second-largest canyon in the world, behind only the Grand Canyon in Arizona. The trek begins in Hobas and requires four to five days to travel the 55 miles (90 km) to Ai Ais. Along the way, you’ll encounter several viewpoints, soothing hot springs, and some of the clearest views of the night sky you can imagine. Handrails and chains are provided for the challenging initial descent. Bring everything you need, including food, water purification tablets, warm sleeping bags, and other basic hiking necessities. Expect rough terrain (sand and loose rocks) and several river crossings. Usually the river isn’t deep, but it wouldn’t hurt to bring along a wet/dry bag or the a backpack with special compartments for wet items and a drain duct to help them dry. Hiking Fish River Canyon is only allowed during the cooler months of May to September. Permits are required and can be obtained in advance from Namibia Wildlife Resorts in Hoba. Hikers must also bring a certificate from a doctor stating that they are in strong physical condition. Standing 560 feet (170m) tall and situated just off the main road, Dune 45 may be the most visited of Namibia’s many sand dunes. The early morning climb to the top of Dune 45 was exhausting, though it took me less than 30 minutes. It was well worth the effort to catch views of the sun rising above the surrounding desert. Don’t miss nearby Deadvlei. It’s a dry pan with 600-year-old dead trees that remain standing, surrounded on all sides by dunes composed of sand estimated to be 5 million years old. For a real adrenaline rush, sign up with a tour company to go sandboarding or quad bike riding on the dunes. The German colonial town of Swakopmund on Namibia’s western coast is the home base for skydiving expeditions. Multiple reputable companies take guests into the desert and offer tandem skydives from 10,000 feet. I decided this was the perfect setting for my first skydive, which proved to be a great decision! The jump wasn’t scary at all. I was overwhelmed by the views of the Atlantic Ocean and the sand dunes as we plunged toward the ground for an ultimately soft landing. If you’re coming all the way to Africa, you’ll definitely want to participate in a safari. Driving through Etosha National Park may be less strenuous than hiking a canyon or sandboarding a dune, but the experience can be just as exhilarating—especially when you’re witnessing lions, leopards, elephants, zebras, and black rhinos up close from the safety of a safari vehicle! Namibia is reasonably easy to get around as a tourist, and English is spoken most everywhere. The ideal time to visit is the dry season, which runs from about June to October. Wildlife spotting in Etosha becomes easier during that time, when the animals congregate around the watering holes. Most international visitors fly into Windhoek Hosea Kutako International Airport, where car rentals are available. From there, the drive to any of the spots mentioned in this article is four to five hours. Unlike much of Africa, Namibia does have a few bus and train routes connecting its major cities. To avoid theft, keep your belongings in a suitcase or backpack hidden in the trunk.